The following pictures were taken less than two months after relocating to a new place. Although I had a lot of machines already, there was a lot of room for growth. Looking back at these pictures ten years later, I am surprised not to find shelves everywhere - simply because I did not have a need for that many shelves back then! You only have seen about a third of all the systems in there. Say, if you were to bend down, you'd discover a tower of machines hidden under the table. This is an eight inch floppy disk box, from Digital. It contains original VMS floppy disks; version 1.6, no less, dated from late '79. 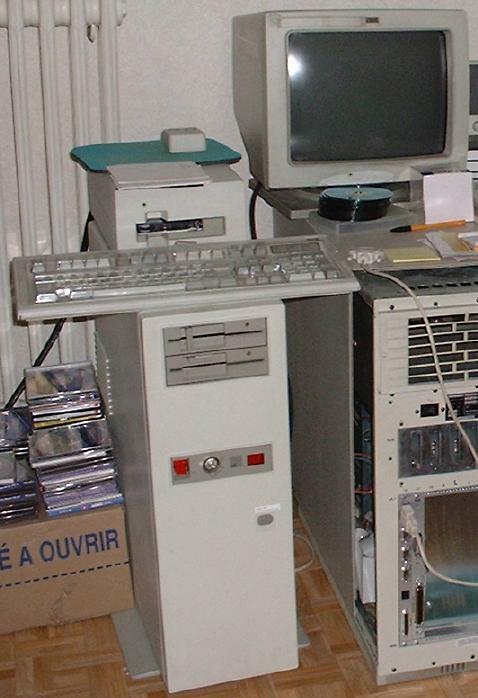 VMS version 1 could still be considered a prototype, as it was still a 16 bit system, running in PDP-11 compatibility mode on the first VAX model. This version was not even self-contained, as it had to boot from RSX-11/M... There is also the Fortran compiler in the box. The left wall also has oddities. 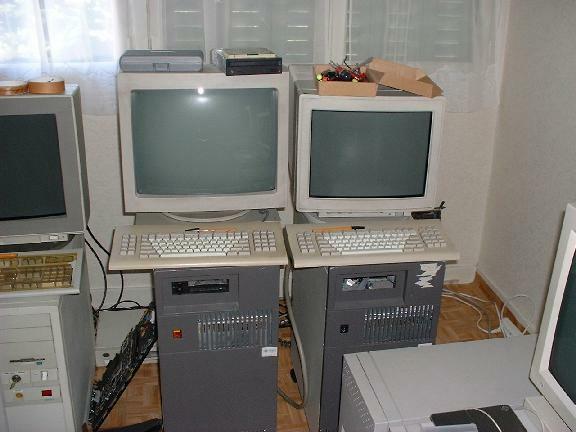 The leftmost machine is an IBM RT PC (better known as the ROMP), the predecessor of the RS/6000 line of workstations. 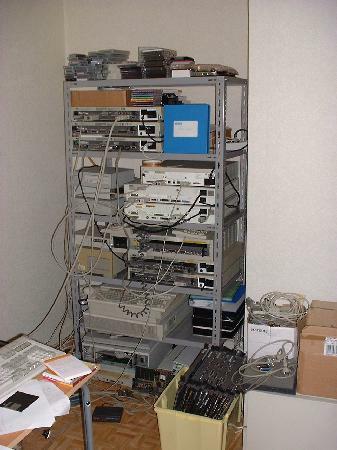 Between the two peecees in the center, the blue mini-tower case is a BeBox, one of the machines built by Be to run their own BeOS operating system... 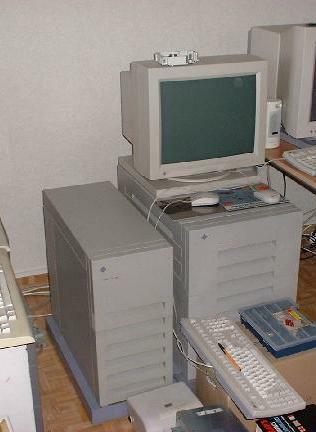 This is a dual-processor PowerPC 603, running both at 66 MHz in this configuration. There were less than 1000 such machines ever produced. 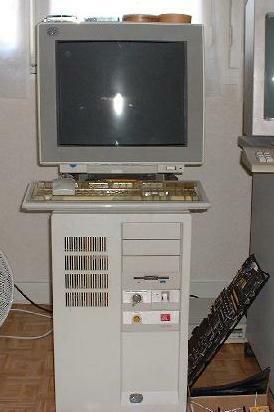 Later, a 133 MHz version was designed, but there were even less such machines produced (less than 900). A nice addition to my collection! And there is even room to work in there! This picture used to be proof the chair, although very damaged, hadn't collapsed under my weight yet at the time the pictures were taken... However, it did not take long for the chair to be damaged beyond all repair, and I replaced it with one of those so-called ergonomic footstools, where I could rest my knees. Some people have asked me about the beige thingie you can see across the wall. Some even guessed correctly. This is the top part of a Livarot box, a delicious French cheese. ROMP's main drawback is its hardware limit to 16MB of physical memory (24bit physical address bus). The second one being the use of the ISA bus, but then there were not many alternatives in the early '80s, Multibus and VME excepted. On the other hand, one could theoretically plug any ISA card in and it would work - assuming there were a driver for it, of course. That's why, although the ROMP came with their own video boards and completely alien connectors for video, keyboard and mouse, you could have one running with a cheap EGA or VGA card and SCSI drives instead of ESDI, using an Adaptec ISA controller. The processor itself is a ``first-generation'' state of the art RISC design, although with not enough general registers (only 16, just like the VAX) to be really fun to write code for. And delay slots, for sure. I am still amazed at the raw CPU power, which is several times better than any 68020 or 68030 (without cache) running at the same frequency. However, ISA bus accesses are awfully slow, and cut the overall performance a lot. 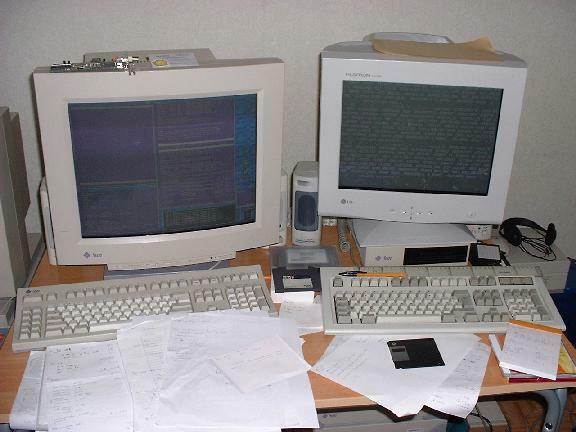 The fancy mouth over the keyboard is a QIC-150 SCSI tape drive, loaded with a tape but not locked. The tape contains a compressed backup of the machine, and with the bootable diskette in the top 5"1/4 diskette drive, the machine is ready to be reinstalled. Unfortunately IBM chose to use a specific one-target-only SCSI controller with a NiH cable, so you can't use anything but their tape drives on it. 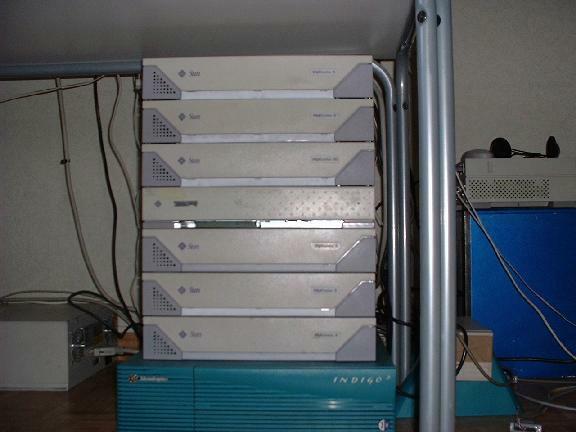 For the record, I have both the QIC-150 and the QIC-24 tape drives in working shape, the latter being somewhat rare, yet mostly useless due to its small tape capacity. This specific model of case, common to all the 5x0 RS/6000 models, is pretty weird. The internal SCSI cable is more than 2 meters long, and has more connectors than one will ever be able to use (i.e. more than 7). Yet, external SCSI-1 devices happen to work, if you use active terminators everywhere. The left crate, a Sun 3/160, was bought by the French army in 1987, and used until the mid nineties. Then its disks were physically destroyed, and the remaining parts were picked up by the local sysadmin, who eventually sold it to me. At the time the pictures were taken, it was still running diskless, but its main purpose was, of course, to be a space heater, and a noisy one at that! Later on, I found another backplane to run the Sun 4/260 in, without needing to share backplanes anymore. I also found an SMD disk cabinet, with a whopping 2x380MB disks, weighting about 40lbs each. Those gray crates are the next generation of Sun's VME machines. I am still really upset that the x30 crate (the small one to the left) is not as tall and as deep as the x70 crate (obviously, the big one to the right). 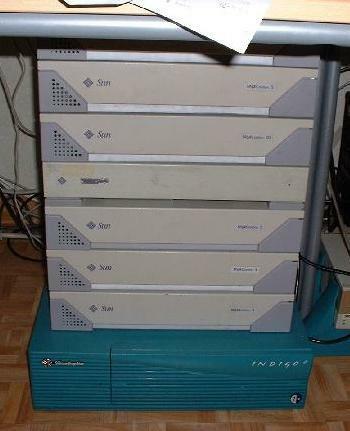 The lowest machine of the pile is an SGI Indigo2 machine, featuring a 200MHz R4400SC CPU. Not as fast as the R10K upgrades, but then I keep the IP22 compatibility and still get a very nice speed. Back then, I was mainly using it to run Netscape (a famous web browser) and Acrobat Reader under IRIX... and also the OpenGL screen savers, especially Electro Paint and Octahedra. I also used to listen to music on it (modules and mp3). 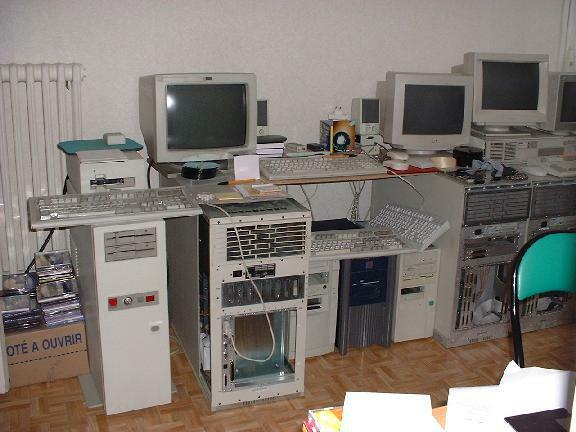 The lower half of the Sparc tower used to be my gateway, my main fileserver, and my desktop machine; I quickly moved these machines to a dedicated set of shelves, so that I can put my feet under the table without hitting them. 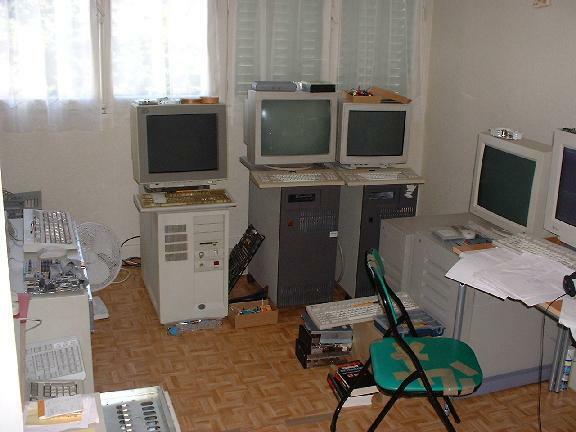 The upper two were sold a few months after this picture was taken, but I have about 10 more Sparc machines left in my cave, some of them awaiting their NVRAM upgrades, half of them even in working shape, that I will either keep as testbeds or give out to good friends.. 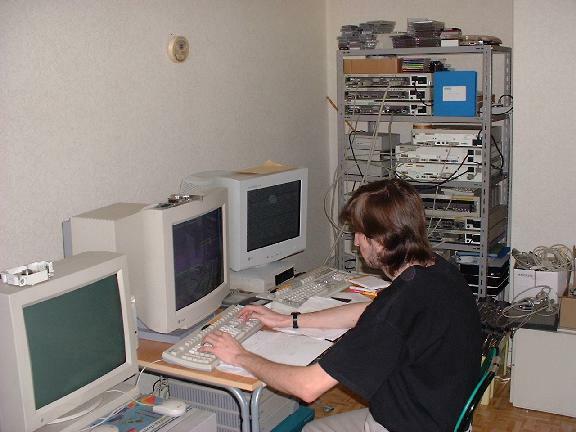 This used to be what my workplace looked like until early 2002. Both keybooards carry the Dvorak keyboard layout. I have been suffering from wrist injuries and tendinitis for years, and switching to the Dvorak keyboard layout has helped a lot to relieve me from these pains, with the added bonus of an improved typing speed. The small black surface under the right screen is a DAT drive, which I use for my regular backups. Don't you also backup your data at regular, short, intervals? You should. What a mess here! The blue box is an Alpha 164LX machine I assembled myself (this is an ATX motherboard with ISA and PCI slots). I used a regular PC case for it, with a strong power supply though, and to make the machine different from the common ugly beige found everywhere back then, I painted the box in blue, except for the front, which I painted in black (front drives bezels included). There used to be a lot of knots in the cable madness there. 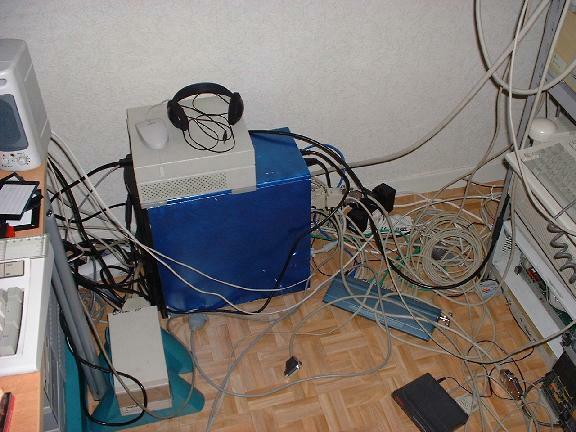 I eventually cleaned this area before it would become a knot factory, though, and now most of the cables are suspended above the ground. This is much better when it comes to clean the room. Pictures courtesy of Brice Cazaux.